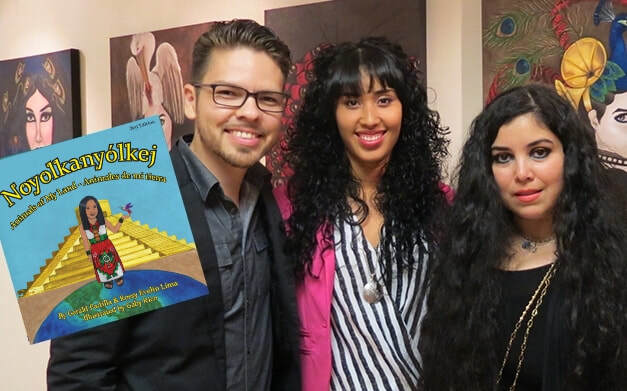 Noyolkanyolkej / Animals of My Land / Animales de mi tierra is a trilingual book by Rossy Evelin Lima and Gerald Padilla, designed to nourish the important bond between language and culture. It is the first children's fiction book published in Nahuatl in the U.S., serving as tribute to our majestic native heritage. In this book, children will meet a young Mexica [meːˈʃiʔkaʔ] girl named Quetzali who will introduce them to animals endemic of Mesoamerica. From the Jaguar, Coyote, Butterfly, Rabbit, to the mythical Mexican Salamander and so much more, children will be able to learn the names of these animals and interact with them in English, Spanish and Nahuatl. Whether you would like your children to begin learning a second or third language, or have them learn to treasure animals as our friends, Animals of My Land ​will surely provide readers all of these experiences as well as the opportunity to reconnect with the great Aztec civilization. Rossy Evelin Lima (Veracruz, Mexico) is an international award-winning Mexican poet and linguist who has been published in numerous magazines, journals and anthologies in Europe and the Americas. She is a strong advocate of college education and reading development in the American public school system. She was a featured poet in the Smithsonian Latino Virtual Museum and was invited to speak at TEDxMcallen about her experience as an immigrant writer in the U.S.
Gerald Padilla (Los Angeles, CA) is a translator, educator and cultural promoter. He is co-founder of the Latin American Foundation for the Arts; association dedicated to the widening and promotion of Latin American arts and culture, and co-founder of FeIPoL (Festival Internacional de Poesía Latinoamericana) in McAllen, TX. Gaby rico (Tamaulipas, Mexico) is a self taught artist who began painting in 2006. She now lives in Edinburg, Texas, USA. Rico has exhibited art work in multiple cities across the Rio Grande Valley, San Francisco, San Diego, Los Angeles, and Italy. You can purchase Noyolkanyolkej / Animals of My Land / Animales de mi tierra through Amazon. Click here to purchase.